In 1981 the U.S. Air Force developed a requirement code named "Senior Sky" for new air superiority fighter to replace the F-15 Eagle and F-16 Fighting Falcon, culminating in the flight test of two technology demonstrator prototypes, the YF-22 and the YF-23. The Raptor is a fifth-generation stealth fighter produced by the United States; it was the result of a request for proposals to which Lockheed/Boeing/General Dynamics and Northrop/McDonnell Douglas responded by 1986. In 1991, the Lockheed-led YF-22 was selected over the YF-23 as the final procurement choice because it was considered more maneuverable and potentially adaptable to naval use. Although the USAF had initially planned to order 750 units, production finally ceased in 2009 after 187 aircraft due to cost overruns. The Raptor relies on highly complex software to correct its flight automatically following pilot input. Its manufacture being delegated to a large number of subcontractors, many issues developed such as high costs and quirks in system operations. In 1992 and 2004, two incidents related to the flight control system caused the crash of an aircraft; both pilots ejected safely. In 2011, the entire fleet was grounded for four months because of oxygen supply issues; pilots reportedly lost alertness, memory, and experienced problems breathing. 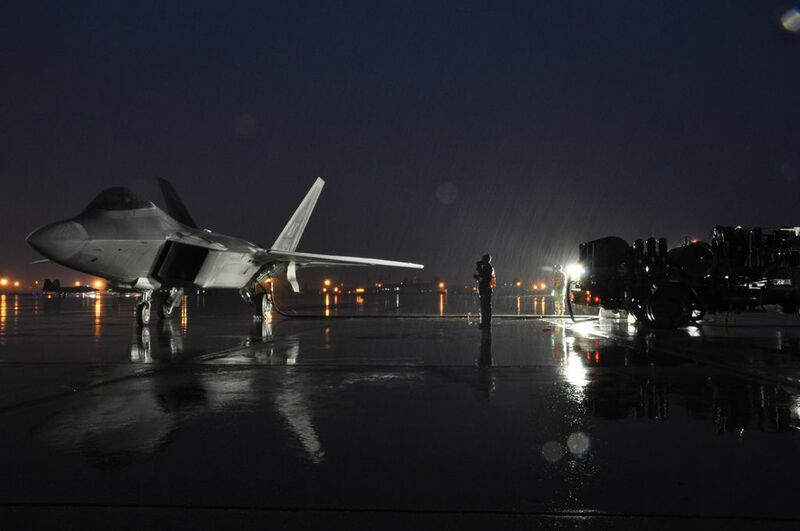 Upon being deployed to Okinawa, Japan, six F-22s were returned by ship to resolve software issues created by crossing the International Date Line. The Raptor’s stealthy design makes it difficult to spot by the high-frequency radars used in enemy aircraft. Also, because its weapons bays are inside the fuselage, the airplane’s speed and aerodynamic efficiency is higher. 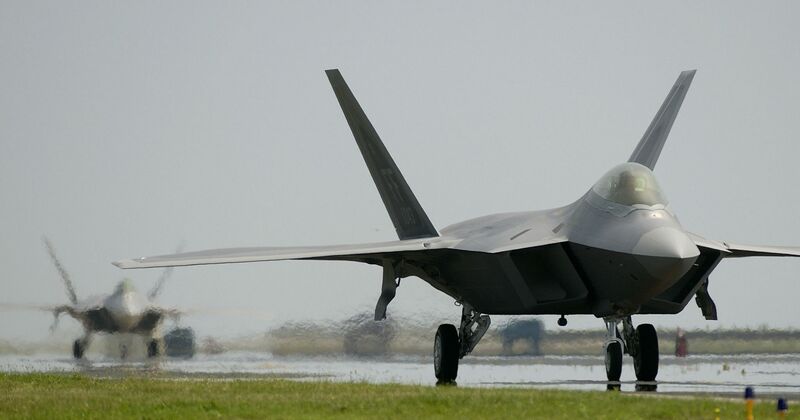 Nevertheless, the stealth coating is difficult to maintain; originally, the F-22 required 30+ hours of maintenance per flight hour; by 2009, however, that number diminished to 10.5 hours per flight hour. One main advantage of the F-22 is its supercruise and supermaneuverability characteristics. The Raptor can operate at Mach 1.86 in optimum configuration using supercruise, and is estimated to be capable of exceeding Mach 2 in full afterburner (the exact statistics being classified). Supercruise increases the aircraft’s speed while remaining sufficiently fuel efficient for sustained flight. The aircraft’s supermaneuverability is aided by its thrust vectoring nozzles and its computerized flight control system; it can conduct maneuvers such as the J-turn and Pugachev’s Cobra. 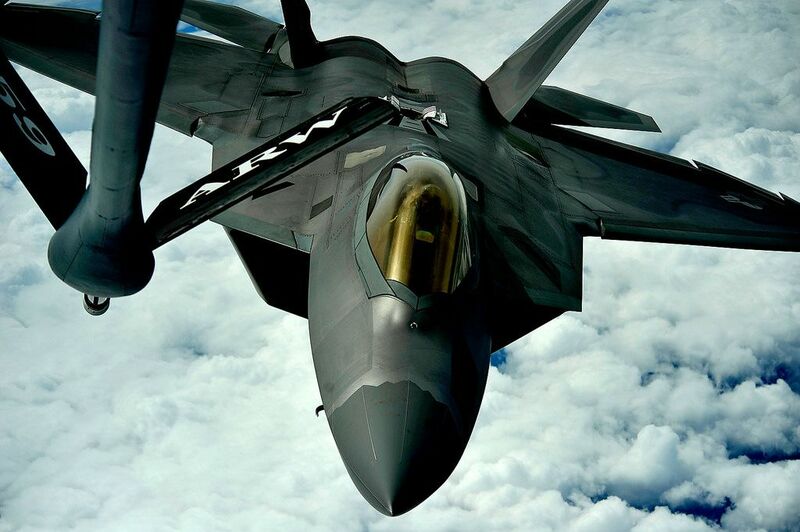 Until today, to conceal military secrets, the F-22 is banned to export. Israel, Japan, and Australia had to abandon obtaining the aircraft due to its unavailability and cost. Advances in low-observable technologies provide significantly improved survivability and lethality against air-to-air and surface-to-air threats. An F-22 Raptor pilot positions the aircraft to accept fuel from a KC-135 Stratotanker. Airmen perform a hot pit refuel with an F-22. Hot pit refueling is a procedure performed in order to rapidly refuel the aircraft and allow it to complete a second sortie in a short amount of time. Unless otherwise mentioned, this webpage and its content is licensed under the Attribution 4.0 International license. You may quote and copy this material if you give correct credit to the author and do not distort or otherwise change the original meaning of his words. Copying any material on this website without giving correct credit to the author is both plagiarism and copyright infringment, and will be treated as such. Denis G. Labrecque published this document on March 02, 2016. Proudly hosted on GitHub using Jekyll markdown.